South Africa want to use their recent series win in Australia as a stepping stone to cement their position as the world's dominant test team and to build something "really special", captain Graeme Smith said on Wednesday. The Proteas, who have not lost an away test series since 2006, won their second consecutive series in Australia after their victory in the third test in Perth. They have a rating of 123 in the test rankings, with England in second place on 117. South Africa take on New Zealand in a two-test home series in January and Smith said the tests would provide the Proteas the opportunity to build on the momentum from Australia. "We are enjoying the opportunity to be here. We have worked hard to be here and we knew that Australia would be the big stepping stone for us holding onto number one (ranking)," Smith told a news conference. "We have given ourselves the opportunity for our home summer to create a bit of a gap between us and the other teams. It is an opportunity to build something really special. The motivation for us will be to beat New Zealand first up," he added. South Africa's success in the test arena has led to some calling the current Proteas team the best ever, but coach Gary Kirsten was quick to play down such suggestions. 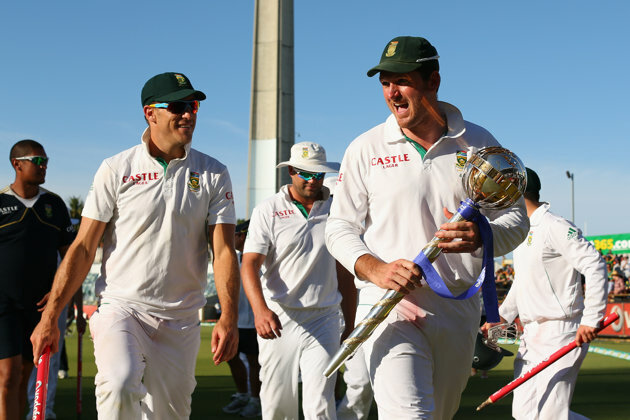 "It is a very special achievement for the Proteas and South African cricket. I don't think that what this team has achieved, over a long period, should be taken lightly," said Kirsten. "It has been nothing short of remarkable. We have played 10 test matches this year, nine away from home, and won series in England and Australia. "But it is always difficult to compare (different eras). In terms of this team's achievements there is no doubt that they are up there but I think that the players would be reluctant to compare with different eras." South Africa, who became the first team to win consecutive series in Australia since West Indies in 1992/93, had found success due to a growing maturity in the squad, Smith said. "Having players that are able to perform around the world is a key factor and our understanding of how to be successful away from home.